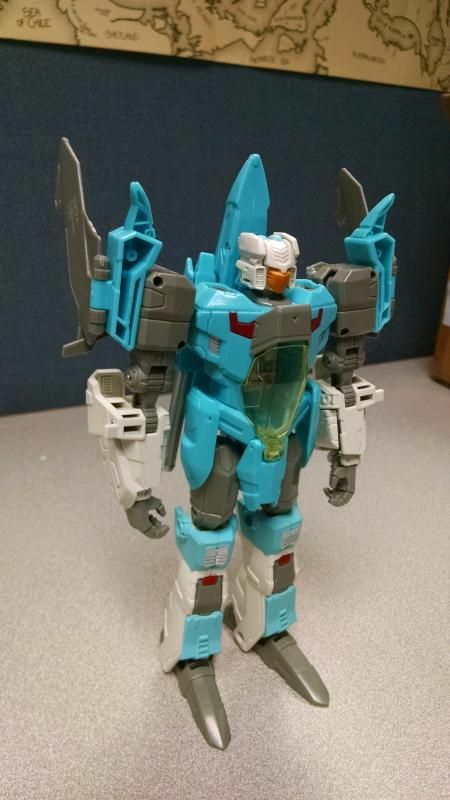 Found Gens Voyager Brainstorm this week, modded him a bit. The alt mode has a couple problems- first, the robot arms are just folded up on the sides, looking huge and blocky and not at all like jet parts. And the rear of the jet has a big empty space above the robot feet/legs. And I didn't like how the wings sweep backward, they are mounted too far to the rear to sweep rearward. I started by changing the transformation so the arms swing backward, and fold into the empty space somewhat. This also flipped the main wings so they sweep forward, much cooler IMHO. 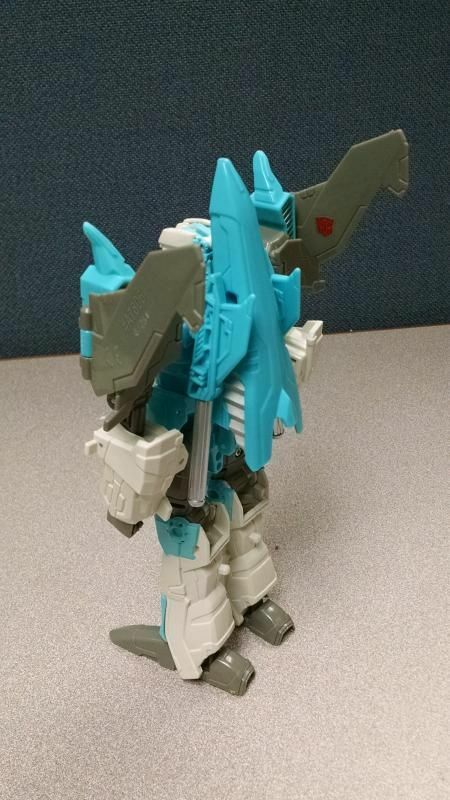 But, this also put the small vertical fins underneath, so I swapped the shoulders left to right. This puts the fins back on the upper surface of the jet, but sweeping forward as well. Didn't like that, so I swapped the fins left to right as well. 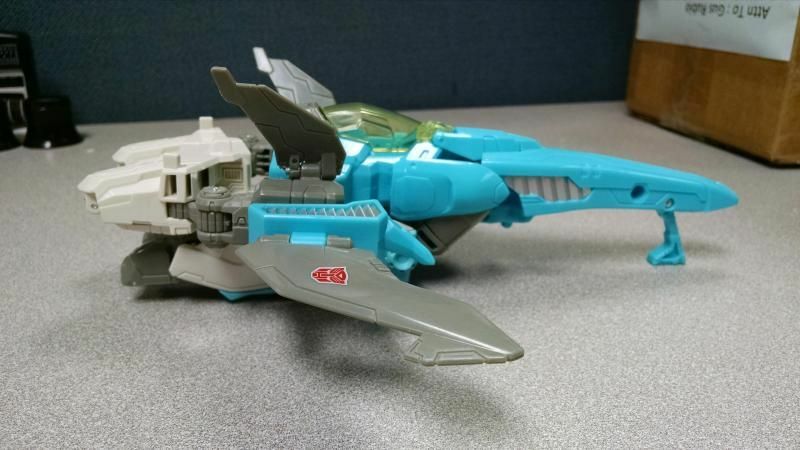 Now the alt mode has less obstructive kibble on the sides, and the empty space at the rear partially filled, and super-keen forward-swept wings. 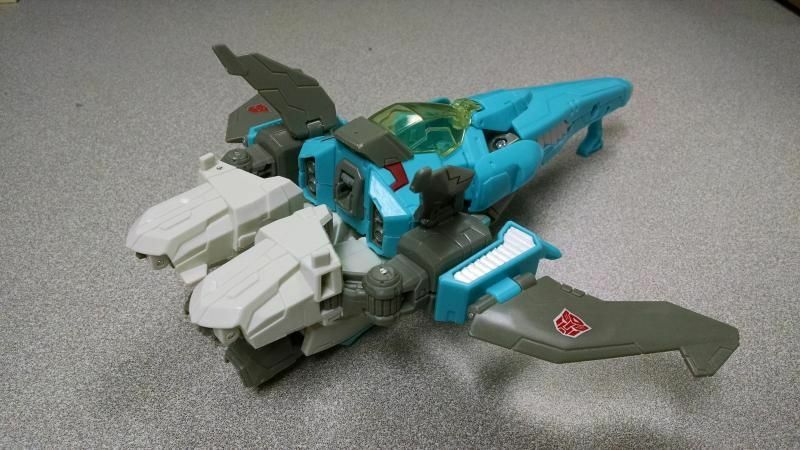 This does change where the rear sits in jet mode, not on the "landing skids" anymore, but on the blue shin parts, but I don't mind. 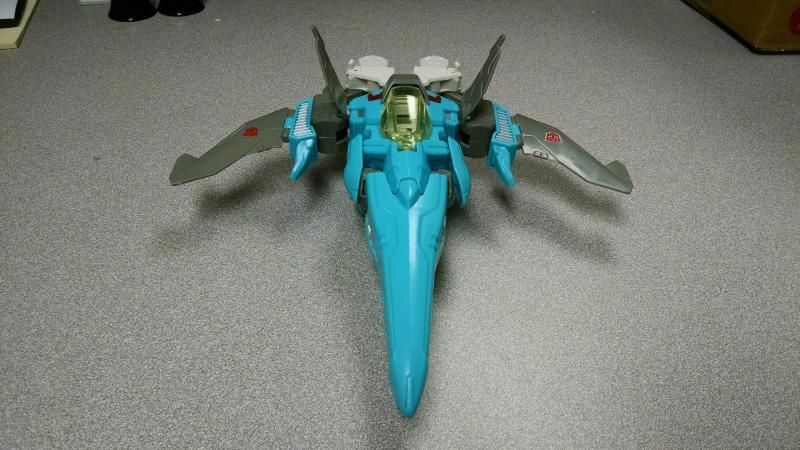 As for robot mode, the small fins are now on his back, along with the silver-painted vents on his shoulders, which is OK by me because IMO they are jet details, not robot details. The Autobot logos on the wings now face rearward, though, but that’s easily remedied with Reprolabels. Also, the screw holes for the shoulders now face front. Lastly, I removed the ratchets in his hips and shoulders and made them smooth friction joints, so the arms and legs don't have to be so far apart or close together. And that’s it. The hardest part is pulling the pins to swap the vertical fins. It's so simple, it's genius. Especially with the arms now being on the back of the jet, rather than the sides. It's almost as though it was designed that way. Motto: "If you don't believe in the ridiculous absurdity of your genius, than who else will?" how do you switch out the ratchet joints for the hips and shoulders?? and where do you find smooth joints to replace them with? Any info would be appreciated. Maybe could make a video and show how you did it and what you used? Motto: "Strive Always for the Indomitable Victory of Good." Could you show how you did the arm mod? Did it involve using new parts, or just switching things around? No parts required. Just swap the shoulders and configure the arms as shown. I'll try to get more pics for you guys. As for the smooth joints, I do this to most of my TFs. I just remove the little bit inside that catches on the teeth of the moving part of the joint, or, for joints that use a spring and toothed discs, I flip one disc over so its teeth don't catch the other teeth. Sometimes this isn't enough, though, and you still get a floppy joint, so I file down the post that the arm/leg pivots on. When you screw it back together, the post is now slightly shorter and it lets the 2 halves of the joint squeeze closer together. Tight smooth joint! Sometimes, though, that's still not enough, so you have to get creative: you can massage the hole or the post to make them fit tighter. Takes practice. I'll try to make a tutorial, feel free to remind me. Thanks for your interest!